Good evening! So the past couple of days I have been looking at a new brewery that is getting established in Alberta, for now they are running their operations out of Tool Shed Brewery in Calgary. Brauerei Fahr will be a German beer Brewery, so what does that mean? Well it means it will be going with the true style German beers, so you won't be seeing any "IPA" or possibly any "sour" beers, you possibly could be seeing some Dunkels or some good Wheat beers though that will be accordance with the German purity law of 1516 (yes there is a law that is 500 years old) even though they are being brewed in Alberta. Honestly this is one of the most interesting things I have heard, so I really wanted to check out this beer a little closer. 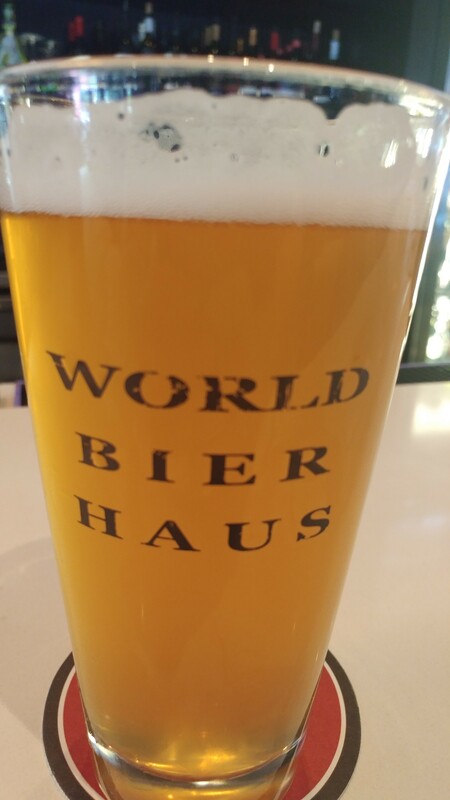 On Thursday, I did just that, I went to 1600 World Bier Haus in SW Calgary and I got myself a Fahr Away Hefeweizen beer, and let me say this beer is.. not was... IS amazing! I've been using the word "crushable" lately and this one is one of the beers that is just that, it is crushable! Not only is it a true Hefeweizen beer, but it also has a very wicked balance between a clove and banana flavor, the smell is just the same as the taste. It truly is a great patio beer that you can enjoy time and time again, giving some of the bigger German breweries a run for their money in this style! IF you ever see this beer on tap do yourself a favor do NOT pass this one up buy it and just take the taste of the beer in, unless you don't like the flavors of clove or banana, then... maybe you might want to pass on it! Coming in at 5.3% ABV. this is a very sought after beer for the people who run taps in pubs, and in liquor stores, and this time of year it is selling even faster and understandably why! Fahr Away Hefe, wow.. just... wow! On Saturday I got a chance to meet with the Brewmaster and owner of the brewery, I have to say it was a wonderful visit and chat with him. His ideas for what he wants to do with his brewery is something you don't really see anywhere else. As a self proclaimed perfectionist he knows what he wants out of his brewery and honestly good for him! I mean while we were sitting there the one of the owners of the restaurant came and talked to him. 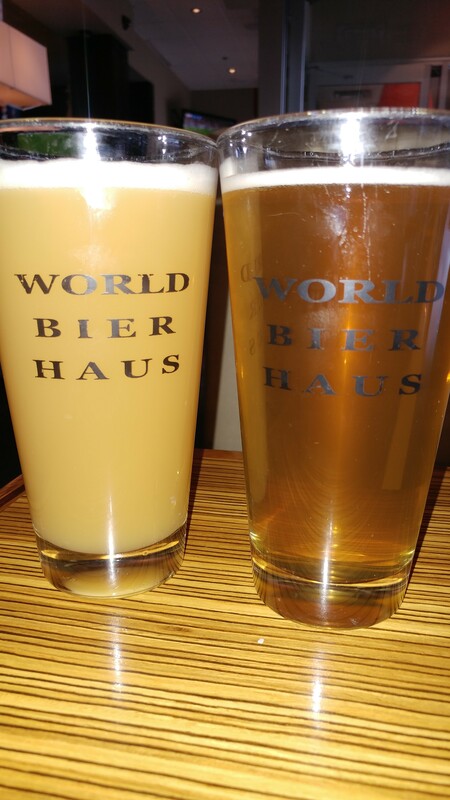 At one point he asked Jochen to make a White IPA, because he thinks he would just knock that style out of the park. As much as I tend to agree, I totally understood when Jochen said "No" to it as it wasn't a true German style of beer. I loved how he is sticking to his guns on this! There was one hard part about our meeting on Saturday, and I really can't fault anyone as it was a comedy of errors on the in regards to getting our beer but we went and ordered his beer from the server, who brought us back and IPA at first from another brewery (granted it was on special and lots of people were ordering it) so we had to get her to take it back, then she brought us back the right beer but it didn't smell or taste the way it should have, so we got her to pour us another two, and when she came back she did bring us the same beer, but as you see in the picture below... they sure did NOT look the same. So we had to talk to her again in regards to this, we were joking around a bit about how she didn't know who he was, but you can tell there was a bit of tension starting to build as this was his beer and he was feeling a little embarrassed and upset that they would do this. We did get our beers after a keg change and line flush and it was the same tasting beer I had on Thursday. We found out that there were a couple of keg changes while we were getting our beer so that is why there was a bit of a mix up and the beers were looking different. After all of this we managed to continue our conversation and really enjoyed the beer with a great couple of appetizers. I'm honestly very excited to see his brewery come to life as a lot of people are asking for his beer and rightfully so. There is going to be a tester beer coming out soon that I will be trying, and you will be able to see that on my Facebook and Twitter pages June 30th! I wish him all the luck however with his beer he may not need any, unless he comes up against Banded Peak... Then that will be quite the battle! For now I'm PK saying Stay Frosty and Cheers!